Contemporary elegance meets classic style with this stunning bouquet. 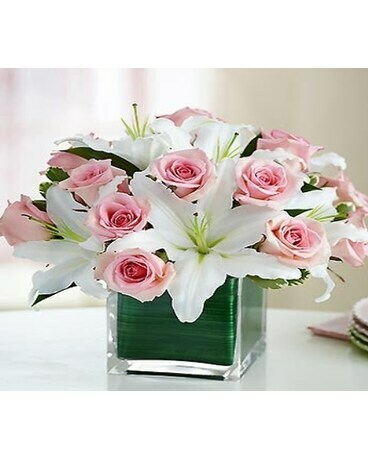 Gorgeous fresh pink roses share the stage with showy white lilies, hand-designed and arranged by our select florists in a compact style. Then, this dynamic duo is gathered in a chic cube vase lined with exotic ti leaf. *Lilies may arrive in bud form and will open to full beauty over the next 2-3 days.